New: GovHomeUSA - Real Estate Bargains! It's funny how often you hear people ask for advice or tips in the investment real estate industry. It's like many people believe that there is just one magic piece of advice that is keeping them from being the next big real estate mogul. It's true there is much you learn while working in the industry but most of it is subtle and can only be picked up through trial and error. Sometimes I can't resist and I answer the question "Buy it cheap and sell it high",of course this really doesn't help any serious investor but it does answer the question. I've been in this industry for over 19 years selling pre-construction and investment real estate. I remember my first few months with a brokerage when other brokers saw I was focusing on second homes and pre-construction real estate investments they told me I picked the wrong market to specialize in and the bubble is going to pop in a few months. They said traditional real estate is where the money is and no one would invest their hard earned money in properties that aren't even built yet. Here it is almost two decades later and the market is stronger then ever and the bubble never popped and pre-construction real estate is the most sought after real estate in the country. Giving investment real estate advice and tips just comes naturally to me and is in my veins. The best advice or tip I can give with pre-construction real estate investing is that if you follow the rules below you'll be that much closer to becoming a real estate investor. This is just the basics of basics but should help the novice to mid level investor avoid some pitfalls. FSBO Tips - Real Estate Secrets Real Estate Secrets Will Save You Thousands. * Anyone Can Be a Real Estate Investor - It's true, there is no secret hand shake or large conspiracy. Investing in real estate is not just for the Donald Trumps and Bill Gates of the world, it's for every decently well off person. Yes you do need money to make money in this industry but you'd be surprised how little capital you actually need, and now with fractional ownership growing in popularity it's even easier for the small investor. * Research Your Development Before You Buy - This seems like common sense but trust me many investors have bought developers nightmare properties. A good example is a hotel owner here in Orlando couldn't rent out his units for $39 a night so he slapped "Phase One Real Estate Available" on the side of his building and sold each of the units for $79,000 a piece. Here's a free tip, don't be fooled by the "Pre-construction" or "Phase One" hype. If a development is a bad investment it doesn't how early you buy it. * Find a Trustworthy Brokerage - I hear horror stories every week of an investor doing his due diligence and finding a great investment opportunity only to be talked out of it by his investment brokerage or agent. Keep in mind that many agents have deals with developers so the more the sell of that project the high commission they get from it. So if they convince you to buy their "premiere" property they can receive anywhere from 2-8% more per sale even though the sales price is the same. The Real Estate Under Ground. 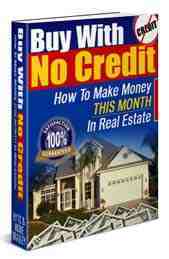 Stop Screwing Around, And Make Money In Real Estate This Month Without Credit Checks. * Browse Before You Buy - This is the classic mistake not just in investing but in any market. Don't buy in the first development you see or hear of. Just because it was the first investment real estate project you saw doesn't make it the best. One of the top reasons new investors want to buy a specific project is because a friend of theirs made a lot of money from it and they want to do the same. This is not always the smartest move, the people who buy early are the ones making the bulk of the profit from a development. If you try buying into the same real estate project 18 months after your friend made a killing in it chances are you missed your big opportunity. The good news is there are many other developments opening up out there that are great investments. Take this tip to heart and remember this little bit of advice, buying a new house isn't like buying a new car. It doesn't lose it's value in a few years, in fact, in some locations real estate usually skyrockets in value in just a few months. If you have any questions about investing in investment real estate or are looking for more specific advice feel free to visit our website ( http://www.investrealestate101.com )or give me a call at the number below.